You are here: Home / All blog posts / Scarf commission! Next post: A new wardrobe! I’m pleased to say that I have a new project! This one is my first commissioned piece – a dragon and phoenix scarf! The knotwork is a Celtic “E” that Kathy provided. 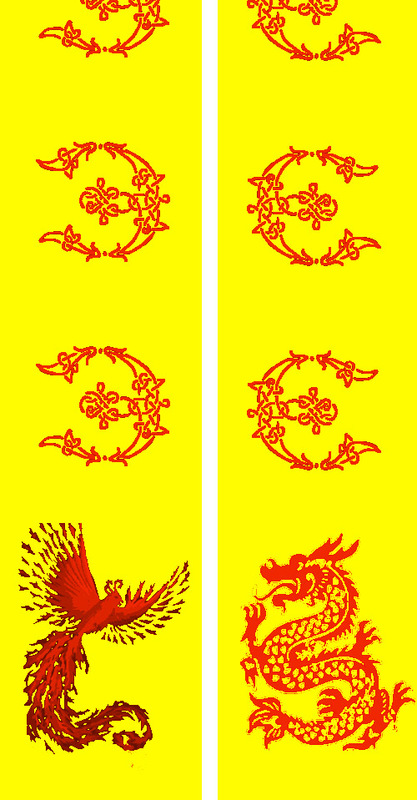 The dragon is a smaller version of the dragon in Ode to Joy, and the phoenix is a smaller, monochrome version of the phoenix in Goodbye, Ma. 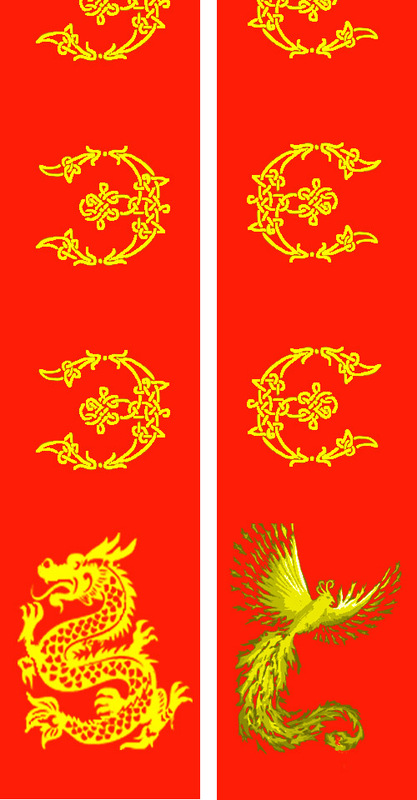 These are actually not quite reverses of each other (the phoenix and dragon should both be flipped horizontally) – but they’re close enough to get the general idea. Kathy likes this design, so my next step will be cleaning up the Photoshop file and converting it to a loom-ready file. Simultaneously, I’ll also be preparing to weave samples. I need to test out several things – weave structure, yarn choice, and color. Because the warp is a mix of 20/2 silk, 10/2 unmercerized cotton, and 16/2 mercerized cotton, it may be a bit heavy for a scarf. So I’m going to start with a relatively thin and supple weft – 30/2 silk, I think. I plan to weave the scarf with one warp and one weft, in a 5-end satin. That is a dense weave, but it drapes well, and will give good color contrast between front and back. Since I can easily weave multiple scarves on the same section of warp, I offered to weave a second and possibly third scarf of the exact same design but in a different colorway. Since no additional design time would be involved, and very little material, I could offer the second and third scarves at a substantial discount. Kathy decided to order two scarves, one using a red/orange warp and another using the blue/purple warp. The red/orange warp will be paired with golden yellow; the blue/purple we’re not sure about, so I’m weaving samples. I plan to test out turquoise, fuchsia, and (just for fun) orange-red. It will be interesting to see what happens! The other thing I need to do is some loom maintenance and tweaks. I was having difficulties with several threads that would not lift for some reason, so I need to figure out what’s wrong with those heddles and fix them. I’m guessing the module just needs a good vacuuming, but I may have to replace a few valves. That is probably a half-day’s worth of troubleshooting. Fortunately, I have new (and beautiful!) toys to keep me company while I engage in loom maintenance/repair. 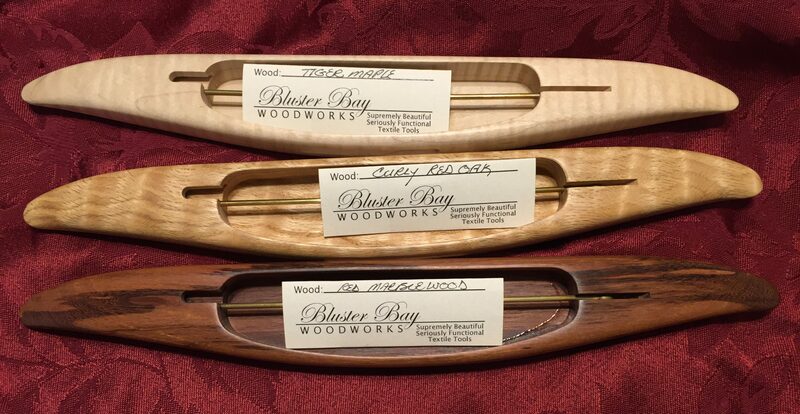 My Bluster Bay 11″ end feed shuttles, which I otherwise adore, are a bit too tall to pass easily through my very dense shed. So I ordered some Bluster Bay Swedish shuttles to work with. 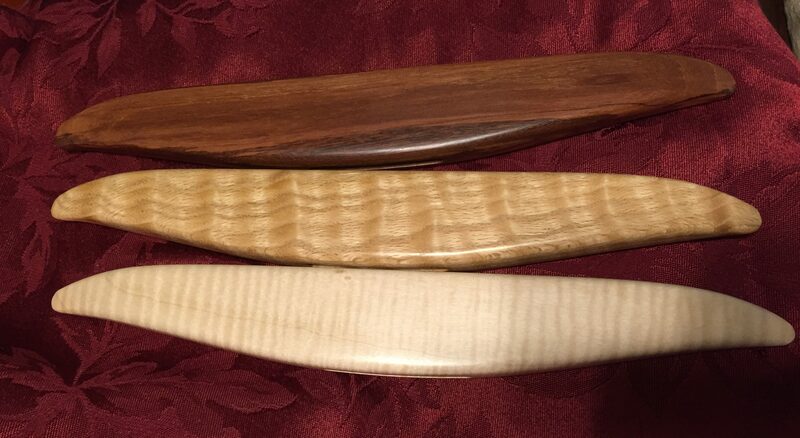 Here they are: tiger maple, curly red oak, and red marblewood. May I say once again how much I love Bluster Bay shuttles? Not only are they marvelously functional tools, but they are flat-out beautiful. And, at only 3/4″ tall, they will work very nicely with this very dense warp. This is a beautiful design. I’m sure the actual scarves are to be stunning.